QOTSA - "Songs For The Deaf", Metallica - "Master Of Puppets", Soundgarden - "Superunknown", Pantera - "Cowboys From Hell", Black Sabbath - "Master Of Reality"
Judas Priest - "Painkiller", KISS - "Dressed To Kill", Mercyful Fate - "Melissa", Nirvana - "In Utero", Rush - "Counterparts"
AC/DC - "Powerage", The Beatles - "White Album", Black Sabbath - "Sabbath Bloody Sabbath", Metallica - "Master Of Puppets", Queen - "A Night At The Opera"
David Bowie - "Alladin Sane", Ghost - "Meliora", Hans Zimmer - "Interstellar", Opeth - "Ghost Reveries", Yes - "90125"
Mustasch - formed in 1998 in Gothenburg by Ralf Gyllenhammar (vocals, guitar) and Hannes Hansson (guitar) with the ideology to make music solely to their own liking. No matter what anyone else thought, Mustasch was to do their own thing - no compromises. Shortly Stam Johansson (bass) and Mats ”Dojan” Hansson (drums) joined the band, and not only because they liked the music but also for the reason the band name were chosen. During the grunge music era of that time, numerous parties based on moonshine, cheap tobacco and lots of hard rock almost always resulted in vinyl sleeves lying all over the apartment the day after. And on one hungover day it just came to them. Mustaches were worn by all the ’70s hard rock musicians : Tony Iommi, John Lord, Freddie Mercury, David Byron etc. Thus the band name Mustasch. After a few years recording demos and playing local clubs awaiting a decent record deal, they finally got the attention from a major label. Mustasch was the first metal band signed by EMI Music Sweden in eighteen years, and in 2001 the EP ”The True Sound Of The New West” was released. It was produced by Roberto Laghi, and with this record the band made a name for themselves on the Swedish metal scene. In 2002 the album ”Above All” was released, once again produced by Roberto Laghi, and the track ”Down In Black” was played frequently on both national radio, ZTV and MTV Europe. Now Mustasch became a major player and started touring for real, not only expanding to the rest of Scandinavia but also into Germany. ”Above All” was their first Swedish Grammy nomination - the rising had just begun. Following up in 2003 with ”Rat Safari”, this time produced by Jacob Hellner, the band got their second Grammy nomination for Best Hard Rock. Tracks like ”Black City” and ”6:36” brought the music to yet another level, resulting in a lot more summer festivals in Sweden as headlining act and also as support for Motörhead, Rose Tattoo and Gluecifer in Germany. Back to producer Roberto Laghi, Mustasch released ”Powerhouse” in 2005. This was their last record on the contract with EMI Music Sweden, and since EMI forgot (!) to report the album to the Grammy Awards, there was a mutual decision to hereby part ways with this major label dinosaur. However, ”Dogwash” was the biggest hit on the album, and although the band lacked support from EMI, they continued in growing stronger towards stardom. The issue to be without a record label had to be dealt with, so the EP ”Parasite!” 2006 was released in co-operation with Bohus Entertainment in order to land a new deal. Tobias Lindell, who previously only worked on the dance and DJ-scene but wanted to try on the metal genre, made his first appearance as producer for Mustasch on this EP, and Regain Records, a Swedish multi-metal label, took them in and gave the band full creative control over the upcoming album ”Latest Version Of The Truth” 2007. And there it was, the first Swedish Grammy Award for Best Hard Rock album for Mustasch, and a huge success with the singles ”Double Nature” and ”Bring Me Everyone”. In 2008 Hannes Hansson left the band to spend time with his family, and after a short while with temporary guitarists, the perfect replacement for Hannes was found in David Johannesson (ex Sparzanza). But in less than a year the next problem arose: Mats ”Dojan” Hansson had to leave the band right in the middle of a studio session due to chronical arthritis. This had been a growing problem for Dojan the last couple of years, and on several shows during that time drummer Danne McKenzie helped the band out when needed. He was of course the natural choice to grab the drumsticks, so he joined the band in march 2009. But this didn´t disturb the band´s urge for progress at all, and the selftitled album ”Mustasch” 2009 was released, and the band received yet another Grammy for Best Hard Rock. It seemed like working with Tobias Lindell paid off once again, and the touring attendance exceeded well past the band´s history. As Regain Records now had gone bankrupt (in spite of Mustasch’ success), a new record deal was signed with Gain/Sony Music. The first studio album with the new label was ”Sounds Like Hell, Looks Like Heaven” 2012, but this time Ralf wanted to produce it all by himself and with Stam and David as engineers. In co-operation with the Swedish Touring Car Championship the music video directed by Patric Ullaeus for the brilliant single ”The Challenger” was a great success and landed Mustasch their first Gold Record. The time came for yet another band member to part ways with the band. Danne McKenzie and Ralf felt that, as they´ve been close friends long before even playing together, they wouldn´t let their different musical opinions jeopardize their friendship. So, exit Danne and enter Jejo Perkovic (ex Candlemass, Infinite Mass). Jejo even took the drums on the following tour in Scandinavia and central Europe, and after that the time came to bring his stuff into the music-making. ”Thank You For The Demon” 2014 was next up for release, and David brought in Rikard Löfgren and Gustav Ydenius from his Sparzanza days to co-produce the album. The album scored the best reviews throughout the Mustasch career, and the band started growing tremendously in Finland and Germany with extensive headline touring, including the biggest festivals in said countries. It´s now time for the eighth album with Mustasch in fourteen years, and the first single and music video (once again directed by Patric Ullaeus) is titled ”Be Like A Man” with the release date set to April 29th. The album will be out in September, and acordingly will the album be called ”Testosterone”. Rikard Löfgren is producing this one by himself having Jacob Hansen (Volbeat, Amaranthe) is doing the mixing. 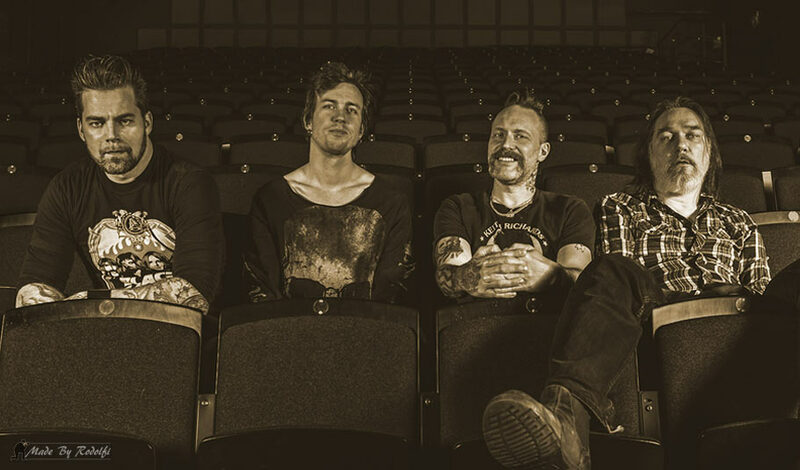 Many a time has the Mustasch music been called diesel-hardrock and drinking-music by fans and reviewers, and the band has not surprisingly just begun a co-operation with Honda Motorcycles in Sweden. - On our new album I deal with my manhood, dignity and tenderness. Testosterone has unfortunately had a negative connotation. Why, then, I wonder? Macho is something I have never recognized in me. To take care of my loved ones has always been more important to me. On the new album I have released just everything! David and our producer Richard Löfgren went off to Tenerife and wrote songs. Jejo have been given free reins with his drum playing without me being there anxiously poking and spreading unrest. Now that I don´t play any guitars on the album, I can hear the fierce guitarist David de facto is, which I had completely missed. Stam is one of the world´s best bass players, so there´s everything as usual (phew!). How will this new album sound then? - A record with a musical theme, I can proudly say. A record where the whole band has been through and added their touch and the producer has been very responsive. There are big, hard riffs and double bass drums (yes!). And thanks to that I can devote all my time and energy on the vocals and lyrics; large and numerous choral arrangements. A burden lifted from my shoulders, the new sound being formed, both hard and soft at the same time. Nothing I am ashamed of, quite simply. I stand up for my manhood. But if you´re big and strong you should be able to behave well! // Ralf, Ambassador of rock!